The homeowner of 113 East Ellerbee Street applied for and received a historical plaque from Preservation Durham in 2016. The following information derives from the plaque application, prepared by Jan Hessing and Tom Miller. In August, 1924, R. E. Dillard laid out lots in a new subdivision he called Elerby Heights. The subdivision contained about six blocks and ran from Highland Avenue west to Shenandoah Avenue. Ellerbee Street (originally, but only briefly, "Elerby") was the subdivision's east-west axis. The lots in the subdivision were laid out in narrow 25’ strips which purchasers could buy in groups of two or more. A minimum of two strips would be required for a building lot. Newly platted Ellerbee Street was ideally suited for suburban development. A right turn onto Roxboro Road and it was an easy two-mile drive straight to downtown in one's new Model-T. In 1926, Dillard sold Jasper Hare and his wife Irma two strip lots at the corner of Highland and Ellerbee. While it is impossible that the house on the property was newly built at the time of the purchase, it is more likely that the Hares had it built. They had been living on Wilkerson Street before moving to 113 Ellerbee Street with their little girl Hazel. The Hares first appear on Ellerbee Street in the 1927 edition of Hill’s Durham Directory. The address assigned was 301. As more houses were built, the house number changed a couple of times before becoming 113. Jasper Franklin Hare was a retail salesman for most of his life. In the 1927 directory, he is listed as working at “Sou Battery & Elec Co.” In the 1930 U.S. Census, his occupation appears as “battery service” and auto repair. He is listed simply as “slsmn” in the 1939 directory. According to his 1917 draft registration, he was born on November 9, 1886. He was tall. His eyes were gray and his hair was black. At that time, he was a farmer near Apex in Wake County. Jasper died on November 21, 1961. His death certificate cites the cause of death as a “cerebral thrombosis” or a stroke. Jasper’s wife, Irma White Ashworth Hare, was born April 20, 1895, according to her grave marker in Maplewood Cemetery. (Irma’s name is spelled “Ima” on deeds and in census records, but “Irma” in other records. It is likely that even though her name was Irma, she was called Ima by those who knew her.) She died on April 26, 1975. The Hares were devoted members of the Grace Baptist Church and are buried together in a family plot the annex at Maplewood Cemetery. 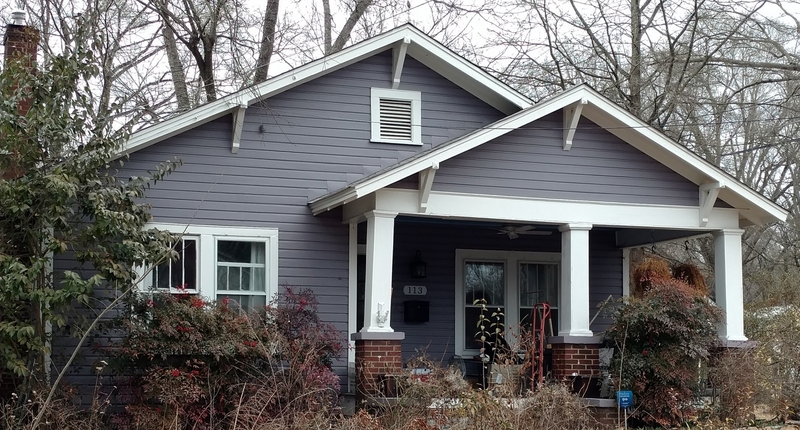 The Ellerbee Street house is a prototypical front-gabled bungalow type. It has two asymmetrically nested front gables, with the lower one extending forward over the porch. Tapered square wooden porch pillars rest on brick piers and the porch stairs are flanked with brick wing walls topped with molded concrete copings. Above, shallow gables have identical triangular knee braces. The house has large double hung windows with four vertical panes in the upper sashes. Half-size windows in the living rooms and kitchens also have the four vertical panes. The large windows on all sides allow streams of daylight into the interior. The exterior wood siding is original. The house retains most of its original moldings including baseboards, window frames and stair banisters, as well as hardwood floors and beadboard ceilings.Other details from original construction also remain including door hardware, light sconces and door bells. Originally, coal burning fireplaces heated the house. The one in the living room still has its original cast iron fittings. Fireplace surrounds and mantle details are original. The central hallway has been blocked off at the back. The former back porch has been incorporated into the kitchen, with its ceiling raised to the gable under the roof and a new back door. Except for the modifications made to the kitchen, the floor plan remains largely unchanged.